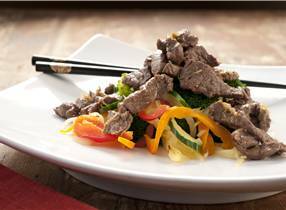 A fab vegetable stir fry using farm-raised venison. The stir-fry can either be bought from a store, or, if using leg cuts, the trim works really well. Heat the oil in a wok until steaming hot. Add garlic and ginger and stir fry for 1 minute. Add onion, red and orange capsicum, broccoli and courgette. Stir fry for 1 minute. Add water, cover and leave to steam for 2 minutes. Remove from wok and keep warm. Heat second measure of oil in the wok with the ginger and spring onions. Add venison and stir fry for 2 minutes. Add salt, soy sauce, sugar and water. Spoon vegetables onto serving tray and arrange meat on top.